Comprehensive review of Dove DermaSpa Summer Revived Body Lotion. See what real experts and actual users have to say about this self tanning product. This self tanner got a 1.75 rating from me. It’s more of a gradual tanner because the color is so light. But even used as a gradual tanner, I don’t think you’d get more than a very light tan. The product is a white, thick lotion, and it takes a long time to dry on your skin. My skin also looked shimmery after applying it, which I wasn’t a fan of. It smells pretty good, but it may smell too strongly for some of you out there. The price tag is super cheap, but in this case I think you get what you pay for. 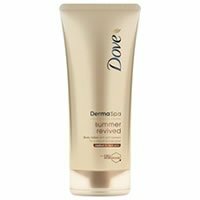 So overall, I gave Dove DermaSpa Summer Revived Body Lotion 1.75 out of 5 stars. This self tanner comes out as a thick, white lotion. The product itself is thick and creamy. I think it’s easier to apply this one sans tanning mitt. Just make sure you wash your hands after application. The product blends in nicely to your skin, it reminded me of applying a body lotion. This one has no color guide so make sure you take your time applying it so you don’t miss any areas. Dove DermaSpa Summer Revived Body Lotion took about 45 minutes to dry. It’s very thick in texture so I kind of expected this, but I wasn’t too happy with the drying time. You don’t need to worry about it getting on anything or staining, however. That was a small plus. This tanner smells pretty nice. It has a clean and fresh scent to it, but it may be on the strong side for some of you who are sensitive to smells. But I personally had no complaints about the smell. I could smell a tiny bit of the clean scent the next day, also a little DHA. My tan I got from Dove DermaSpa Summer Revived Body Lotion was very light. I tried the “medium to dark” shade and it definitely wasn’t even close to medium or dark. My tan was about a shade lighter. It was natural looking and streak free, but just extremely light. This is definitely a gradual self tanner even though it doesn’t say that anywhere. The odd thing was my tan was kind of shimmery as well, but it didn’t look like there was s shimmer in the product. Anyways, I wasn’t very happy with my tan. This one only lasted 1-2 days. Like I mentioned earlier, you’ll need to apply daily to see a difference. No. I think it’s way too light and also has a bit of a shimmer to it. This self tanner is so cheap, only $1.44 per ounce. I guess you get what you pay for. To buy Dove DermaSpa Summer Revived Body Lotion, Click Here. Look and Feel This is a thick, white lotion. Application Applying is easy, you don’t even need a tanning mitt. Smell (Before) Smells nice, clean and fresh. Smell (After) The smell was ok the next day, could smell a little DHA. Color Produced My tan was so light and a little shimmery. How Long It Lasts It faded after 1-2 days. OK For Men? No, I think men should skip this one. Price It’s only $1.44 per ounce, which is really cheap.